Hello everyone! My name is Brooke. I am the author of Brookie’s Baby Bargains and am so excited to be the newest team member at Taylor Joelle. I am a work at home mom, blogger, crafter, and lover of all things social media. I can’t believe it’s true, but my baby will be turning one in three weeks! I have been spending the last few months obsessing over her party and dreaming of ideas on Pinterest. I decided on the theme “One” Upon a Time. It will be a fairy tale princess party. I decided to hand make all of her decorations using the Imaginisce “Enchanted” scrapbooking line! One of the things that I am making for the party is the party hats for the other kids to wear. Luckily for me, many of my friends had babies within a few months of me. So, M will have a lot of friends at her party. I am making personalized hats to match the theme for the ones that I know are coming. These hats were so fun and EASY to make. If you have cardstock, ribbon, tulle, and some embellishments, YOU CAN DO THIS! 1. Print a template. 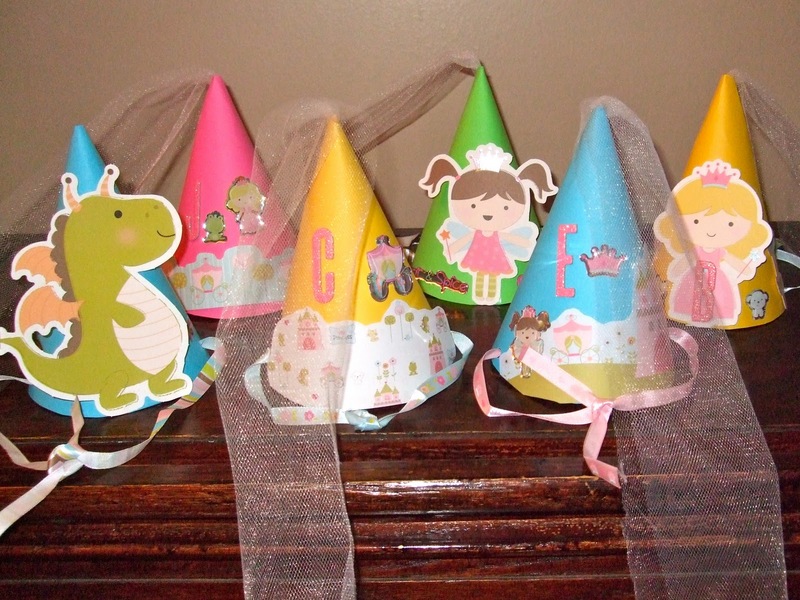 I found this template at this awesome blog that also has other great DIY party hat ideas. 2. Cut out the template and trace it onto cardstock. Cut out the traced shape from the cardstock. 3. Put the tab into the slot. Tape together from the inside to keep it closed. I found that folding down the edges of the tab made it easier to pull through, then I would unfold them and tape it closed on the inside. 4. Use a hole punch or an exacto knife to make holes or criss cross cuts on each side of the hat. Pull the ribbon through the holes. I tied knots at the end of the ribbon to keep it from falling through the holes. 5. To make the hats “princess” hats, cut a piece of tulle at the desired length. Tie a knot at the end of the tulle. Pull the tulle through the top of the hat with the knot on the inside. The knot will keep it from falling out. There you have it! Easy right? I will post more projects as baby M’s birthday nears and will also post pictures of the party! Stay tuned! Good job!This would be perfect for my niece's birthday party. Adorable designs.